For an enterprise cybersecurity program, internal audits are a critical function to ensure that the organization’s security program is scaling at a similar rate to the rest of the organization. With digitization transforming business operations, ensuring that the proper controls are in place as the enterprise evolves is now a board-level concern. Internal auditors act as the third line of defense against threats to the organization. Although, with the increase in geographic and industry-based compliance requirements, auditors using spreadsheets and a checklist-based approach to compliance are increasingly experiencing audit fatigue. As an auditor, you need to ensure that you’re using a solution that empowers your team and delivers the functionality to augment their ability. The foundational aspect of an internal audit management system, your solution must be able to support the development of audit scope and the maintenance of that scope through execution. Ensure that your solution allows you to set a baseline for where your organization is and where it needs to go. This is critical for audit and project planning to remediate any inherent or residual risk within the organization. The CyberStrong integrated risk management (IRM) platform supports an in-depth risk assessment throughout the solution. The risk assessment functionality rolls up into a spider graph that can be shown to both non-technical and technical stakeholders to show where your organization is weak and where to direct resources to reduce risk. Following the risk assessment, your solution needs to capable of supporting remediation efforts by tracking activities and assigning tasks based on the determined approach. The solution should be able to assign resources (people, time, controls) to specific tasks and activities. In the CyberStrong IRM platform, audit managers can manage teams across multiple assessments and tag specific controls to a given assessment. This single-pane-of-glass approach provides managers a central source and a level of insight previously unseen in audit management solutions. To streamline the management process, the solution should also be able to automate the follow-up process to ensure that assignees are staying on track. Within CyberStrong, managers can assign specific controls within an assessment to their team members with assigned due dates. By automating the assignment and follow-up process, audit teams focus on what's important. The ability to track and report on time and expenses for individual projects. In IRM platform with strong audit management capabilities like CyberStrong will allow you to track details such as time and expenses in the notes and comments within an assessment. Your solution must be able to act as a single source of truth for supporting documentation including evidence attachments for individual control tests. A strong audit management or IRM solution such as CyberStrong allows you to attach evidence to a given control in your audit assessment. At a basic level, your solution must be able to consolidate the findings in order to generate a report for the audit committee. However, a stronger audit management solution will provide downloadable reports and visualizations that can be delivered to the board and audit committee to reflect your findings and remediation efforts. The solution must also act as a single pane of glass for the audit process, defining and tracking audit departments and auditors’ KPIs. 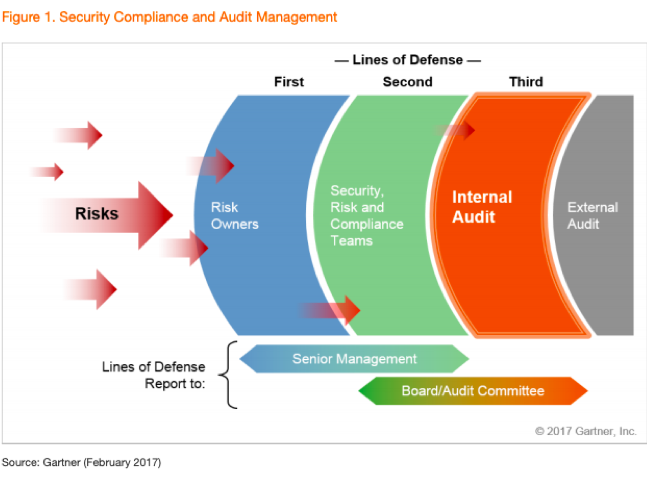 Auditors are a leading force in the shift from a compliance-based approach to a risk-based strategy in many enterprise-level security organizations. External forces such as technology expansion, increase in data collection and use across the organization, and automation are causing regulatory bodies to rapidly release a patchwork to regulations spanning geographies and industries. Forward-thinking security teams see the value of a risk-based approach instead of checklist compliance. For auditors and auditing teams, the rise of integrated risk management further automates the auditing process, providing a single source of truth for teams to access during the audit and remediation process. IRM solutions like the CyberStrong platform that are backed by artificial intelligence help security teams make data-driven remediation plans and streamline the reporting process to deliver to the auditing committee and the board. Read more about the value of an integrated risk management approach and critical capabilities of an IRM solution in the CyberSaint IRM Solution Buying Guide.